Sometimes you just need a little mango in your life. It is spring, and the markets are starting to carry all the different produce that just make you want to have a picnic, or open your windows and let that spring air come through. Of course in Seattle we get a few days here and there, but for the most part it stays cold and rainy until July. So, we have to do other things to make us think that the sun is shining brightly outdoors. My daughters love dessert – but what they love even more is getting dessert at a fancy restaurant. They don’t get to go to fancy restaurants all that often, in fact, hardly ever. I think because of that, it is even more special. It just so happens that recently my younger daughter had the privilege of eating somewhere very unique – and for dessert she ordered mango sorbet. Well, that in and of itself would have been exciting enough, but they brought the sorbet with a beautiful assortment of fresh fruit, and a delicious madeleine. I swear she has never looked more excited. She was almost squealing with delight at the thought of digging into this. She enjoyed it immensely, and it was so much fun to watch. To make the simple syrup, put 1/2 cup of sugar with 1/2 cup of water in a small saucepan. Heat until all the sugar has dissolved. Cool completely. Add mangos, simple syrup and lemon juice in a blender and puree until smooth. Put in the refrigerator until nicely chilled. 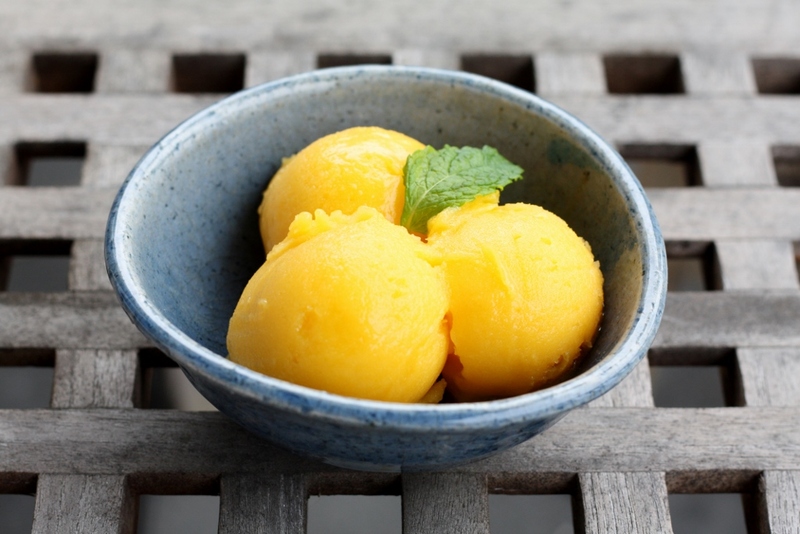 Add the mango mixture to an ice-cream maker and follow the manufacturer’s instructions. Freeze for about 4 hours before serving.